Most fungi grow as tubular filaments called hyphae. An interwoven mass of hyphae is called a mycelium. The walls of hyphae are often strengthened with chitin, a polymer of N-acetylglucosamine. The linkage between the sugars is like that of cellulose and peptidoglycan and produces the same sort of structural rigidity. Some live as saprophytes, getting their nourishment from the surroundings (often having first digested it by secreting enzymes). They perform a crucial role in nature by decomposing dead organisms and releasing their nutrients for reuse by the living. Some live in a mutually beneficial symbiotic relationship with another organism, often a plant. The association of fungus and plant root is called a mycorrhiza. Some 80–90% of land plants benefit from symbiotic mycorrhiza. The plant benefits by more-efficient mineral (chiefly nitrates and phosphates) uptake. The fungus benefits by the sugars and other nutrients (e.g., lipids) translocated to the root by the plant. Mycorrhizal fungi may also form conduits for nutrients between plant species. 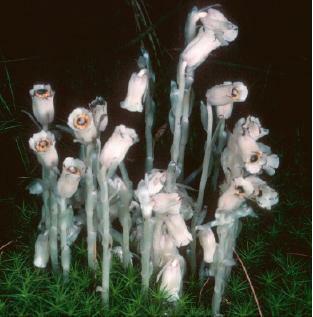 The colorless, and hence heterotrophic Indian pipe (Monotropa uniflora — pictured on the right) is an angiosperm that must secure all its nourishment from mycorrhizal fungi that are attached at the same time to the roots of some autotrophic plant such as a pine tree. Radioactive carbon administered to the pine (as CO2) soon turns up in carbohydrates in nearby Indian pipes. 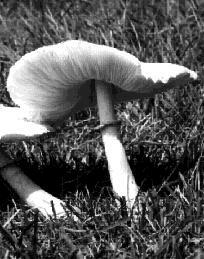 Some fungi are parasitic, causing serious damage to their host (a few examples are given below). Some fungi are both. Metarhizium robertsii is a soil fungus that lives symbiotically with plants but parasitizes (and kills) soil insects. Its hyphae penetrate both the roots of the plant and the corpse of the insect. It has been demonstrated that nitrogen released by the decaying insect is transported by the fungus to the plant. (See S. W. Behie, P. M. Zelisko, M. J. Bidochka in Science, 22 June 2012.) Metarhizium is an ascomycete. ascospores produced following sexual reproduction. Four or eight ascospores develop inside a saclike ascus (the group is commonly called sac fungi). in baking (it is often called baker's yeast). Here, it is the carbon dioxide that is wanted (to make bread and cakes "rise" and have a spongy texture). The truffle and the morel, both highly-prized food delicacies. 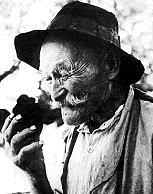 The photo (courtesy of the French Embassy Press & Information Division) shows a farmer from the Périgord (in southwestern France) admiring a truffle. Truffles establish a symbiotic relationship with the roots of such trees as oaks. Lichens are fungi that live in a symbiotic association with an autotrophic green alga or cyanobacterium (the "photobiont") or — in some cases — both. The fungal partner (the "mycobiont") in most lichens (98% of them) is an ascomycete. Zygomycetes make up the remainder. The relationship is often characterized as mutualistic; that is, both partners benefit. But recent evidence (e.g. in British soldier) suggests that while the fungus is dependent on its autotrophic partner, the photobiont is often perfectly content to live alone. Recently many lichens have been found to harbor a third partner, a single-celled basidiomycete. Its function remains to be discovered. 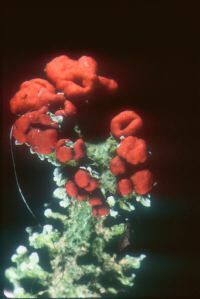 The lower image is of the colorful lichen called British soldier. The fungus is Cladonia cristatella, an ascomycete. 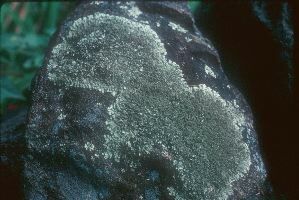 Its name is the name given to the lichen. The photobiont is Trebouxia erici, a green alga. It is found in many other lichens as well, and also can be found growing independently. The algal cells eventually are killed by the fungus, but are continuously replaced by new ones. So the relationship in this lichen is one of controlled parasitism rather than mutualism. The red cap produces the spores of the fungus, but these alone cannot form new lichens. Other structures (e.g., soredia), containing both partners, are needed to disperse the lichen to new locations. Some lichens release only fungal spores. These mycobionts depend for their continued survival on finding an acceptable photobiont released from other lichens. Phylogenetic trees, based on both ribosomal RNA genes and many protein-coding genes, as well as fossils indicate that lichens have been present on the earth for at least 600 million years. Today about 14,000 species of fungi form lichens. Lichens are extremely sensitive to air pollution. One of the best contemporary examples of evolutionary adaptation is the change in coloration of the peppered moth as the lichens in its habitat declined because of air pollution and then returned when air quality controls were put in place. Link to an illustrated discussion. Some modern fungi (e.g., Penicillium chrysogenum, the source of the antibiotic penicillin) appear to have evolved from lichen-forming ancestors — abandoning their original symbiotic way of life. Basidiomycetes include mushrooms, shelf fungi, puffballs, rusts, and smuts. They are dispersed by spores borne at the tips of basidia (giving rise to the name for the group). Mushrooms are masses of interwoven hyphae growing up from the main mass of the mycelium growing underground. The basidia develop on the undersides and release their spores (four from each basidium) into the air. This small group (~1000 species) is thought to be the most primitive of the fungi. Unlike all the other fungi, its members produce flagellated gametes (for sexual reproduction) and flagellated zoospores (for asexual reproduction). They are mostly aquatic. Two species are responsible for the recent worldwide decline in amphibian populations (frogs, toads, and salamanders). An illustrated site devoted to the fungi.